The Talbott Cup is a year long 10th Fleet event that’s broken down into three seasonal 10th Fleet Challenges. It is loosely inspired by similar Cups in other Fleets, such as the San Martino Cup of 3rd Fleet and the Admiral’s Cup of 2nd Fleet. The ultimate goal of the Talbott Cup is to foster activity, camaraderie, healthy competition, and fellowship in 10th Fleet. When a chapter or unit wins a 10th Fleet Challenge they take possession of the 10th Fleet Stein (pictured left). 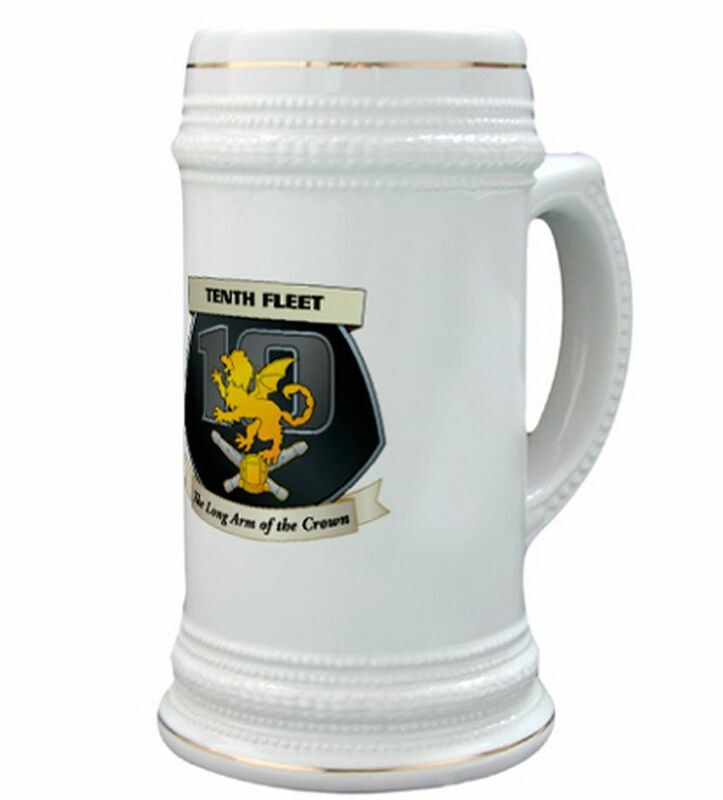 This 10th Fleet Stein is the physical manifestation of our Fleet’s pride and prestige. The victorious crew is charged with protecting the Fleet Stein and treating it as a trophy of honor. The Stein shall be conveyed to a different unit or chapter upon said unit’s victory in the next challenge as determined by the Fleet Command Staff. All 10th Fleet units (RMN, GSN, etc, vessels), Pinnaces, RMA units, and RMMC Assault Shuttles are eligible to participate. Individuals must be officially registered TRMN members who are officially assigned to chapter or unit they are participating with, and must appear on the chapter roster on the TRMN Database. Once an individual’s contribution is submitted to the 10th Fleet Staff Intelligence Officer and recorded, it may not be transferred to another chapter or unit, even if that member transfers during the course of the Challenge. Any marine detachments (MARDET) assigned to a unit shall participate as members of that unit. After the conclusion of the final challenge on December 15, 2019, the chapter or unit that has won the most Fleet Challenges wins the Talbott Cup! If no vessel has won more Challenges than any other, then the performances of the tied chapters or units over the individual challenges will be reviewed by the Fleet Command Staff to determine the overall Talbott Cup winner. The entire crew of that chapter or unit is awarded a Royal Meritorious Unit Citation. The 10th Fleet Stein stays in the hands of the vessel that won the third Fleet Challenge of the year, regardless of who won the Cup. Our first Fleet Challenge of the year runs from February 15th, 2019 to May 15th, 2019. Each chapter or unit selects one representative of their crew to send progress reports of their ship’s efforts at their own discretion (ie: it’s up to the representative and the unit’s CO if they wish to submit their progress reports weekly, monthly or all at once before the final date). Progress reports must be sent to Intel [at] talbottfleet [dot] org with “10th Fleet Gunnery Challenge” and the chapter or unit name in the subject line. All progress reports must include the title of the book, the author, page count, date finished reading, ISBN if available, and the name, rank and TRMN member number of the person who read it. All books are counted equally, with the exception of authors who are also TRMN members (see list of eligible authors here) whose works are worth double points per page read. The chapter or unit with the most books read and submitted in a progress report before midnight on May 16th, 2019 wins the challenge. The winning chapter or unit will be announced and presented with the 10th Fleet Cup at the at BayCon on Memorial Day Weekend 2019. The CO, XO, and Bosun of a participating chapter must have met their rank testing requirements. Any chapter with a member of the Command Triad not tested to their rank shall be disqualified. Only the Gunnery (reading) activities or contributions of an officially listed member of a specific chapter (shown in the MEDUSA database) are eligible to participate on behalf of said chapter. If a member moves from one chapter to another in the middle of the challenge period, all contributions by said member must be removed from the departing chapter and added to the arriving chapter. The member’s contributions move with them from chapter to chapter. Audiobooks and eBooks are eligible. Their page counts/value will be equal to the most commonly listed page count of the corresponding physical book they’re based upon. Final approval is given to the Challenge Director. Magazines, Comics/Graphic Novels are NOT permitted or eligible for this challenge. Each book is permitted to be used only once per person per challenge. Our second Fleet Challenge of the year runs from May 30th, 2019 to August 30th, 2019. The Range Challenge is a competition in which the chapters of a fleet strive to attain the highest total number of hours spent playing games by the end of the three-month challenge period allotted by their fleet commander. These rules are based on similar challenges conducted by TRMN fleets in the past in an effort to standardize them for unified competition under the Black Sphinx Cup.The chapter that has the highest number of hours spent playing games and correctly submits this information during the challenge period wins the Range Challenge in their fleet. For mobile games such as “Words with Friends” and ”Pokemon GO,” this challenge will follow the Army Marksmanship Program clarification forum post found here. There are NO MULTIPLIERS for this challenge. (i.e. : If you play a two-hour board game with two other players, the amount of time that is recorded is two hours). It is highly recommended that members take photos, video, or other media to document their gaming, preferably in uniform, while working toward their marksmanship awards, and include it in their reports. This is not a rule, just a recommendation that could further bolster their portfolio for the Black Sphinx Cup. Our last Fleet Challenge of the year runs from September 15th, 2017 to December 15th, 2017. The Astro Control Challenge is a competition in which the chapters of a fleet strive to have the highest total number of members participate in the Astro Control program by earning their Aerospace Wings. These rules are based on similar challenges conducted by TRMN fleets in the past in an effort to standardize them for unified competition under the Talbott Cup. The chapter with the highest number of members who have earned their Aerospace Wings appropriate for their rank at the end of the challenge period will win the challenge. To be considered Astro Control qualified for this challenge, a member must have completed the qualifications for a pair of Aerospace Wings and been formally awarded the wings before the end of the challenge period. Members may choose to earn any category and level of Aerospace wings. As long as a member has earned at least one set of wings they will be considered qualified for the Aerospace Challenge. Crew members who have already been awarded a pair of Aerospace Wings prior to the challenge WILL BE COUNTED for the total count. Regardless of when a crewmember received their wings, as long as they have a pair they will be counted as being qualified. The most recent date updated»Numbered rows»Each row represents one crew member. Each crew member officially listed in the Medusa database must be included, regardless of their status as aerospace qualified or not.